My cat yarn bowl came in yesterday! I am excited to use it because I am honestly sick of my yarn getting tangled or bouncing everywhere. While this yarn bowl isn’t huge it’s doable! I do plan on getting a bigger yarn bowl for my bigger yarn. Also, this yarn bowl looks like my oldest cat Momo! If you would like to buy the decal please head on over here. Just look at her! She looks like the yarn bowl or more to say the yarn bowl looks like her! Plus, Picasso aka Casso my first baby was a calico kitty. So, this works out perfectly. If they had a Panda I’m pretty sure I would have marked this on my list to get. Pandas and cats are my weakness. Of course, I had to décor my yarn bowl! Even though it’s a cat the back was just to plain. I took advantage of this and created a decal. I have also decided to put this decal up in my Etsy shop! If you’re looking for this decal, then had on over to here. If you would like your shop name added to the vinyl please make sure to submit for a personalization request. The same goes for if you would like to have your decal in glitter. 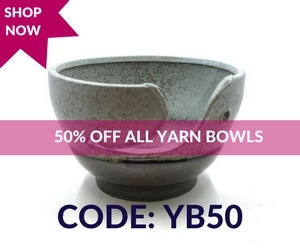 Also, don’t forget Damn Good Yarn is still having a sale on their yawn bowls! 50% off this is a deal of a lifetime for us yarn obsessive crafters. Just use the code YB50. Remember this offer expires April 30th, 2018. If you have been pushing or waiting for a good sale this is it! Don’t miss out or you’ll be a sad kitty and nobody likes to be a sad kitty.